When was the last time you jumped in your car and drove? No plans, no map and no idea where you’re headed? Those “let’s see where the open road takes us” opportunities are rare, but when they happen, that’s when you find the best best kept secrets! I spent last week, just like that. Driving around in the new Ford Mustang, with no set plan and just seeing where the road leads. 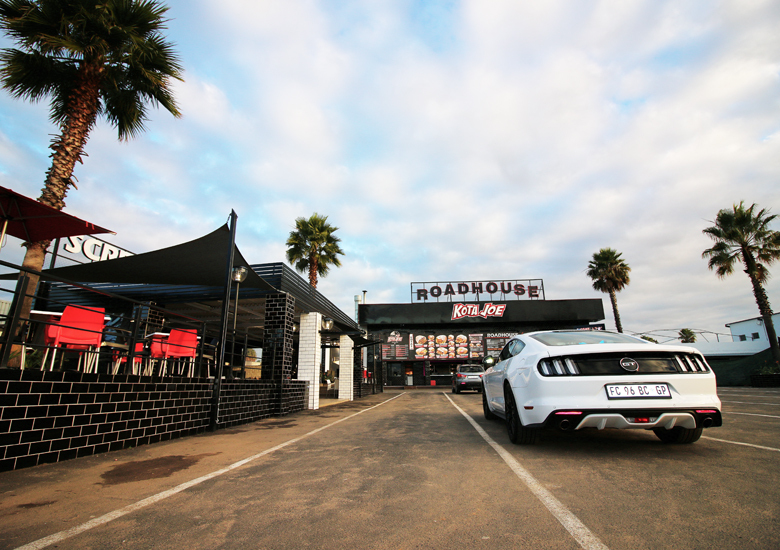 One of those roads (and there were many), led me to the coolest retro styled Roadhouse, where I found the best milkshakes in Jozi. Growing up in the 90’s, we didn’t have drive through fast food joints and Roadhouses were all the rage. They were also the place to go if you wanted a thick and delicious shake to wash down a seriously loaded burger, or an oozing toasted cheese. Ya know, the ones wrapped in paper with a little gherkin on top? 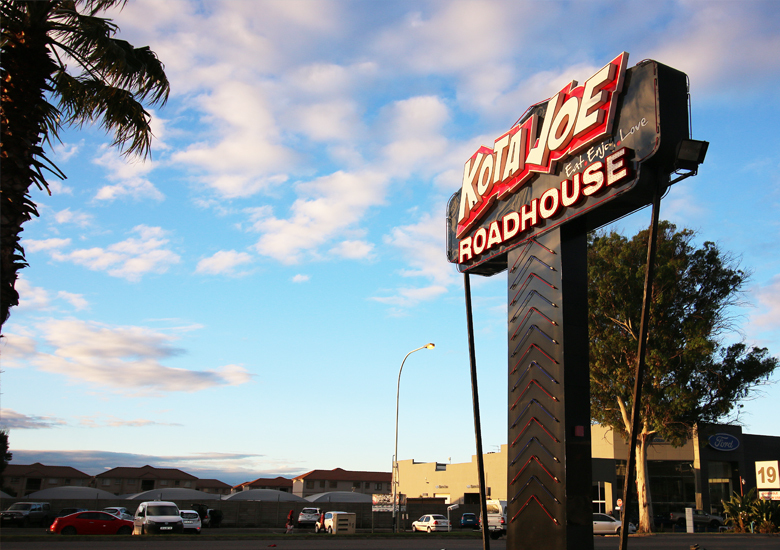 So what an awesome throwback it was to find Kota Joe Roadhouse and get a blast from the past – but this time, in a true American Muscle Car. Back in the day, our parents (or grandparents for some of you) must’ve gotten quite the thrill, pulling up at the Roadhouse for chocolate milkshakes in their ’65 Ford Mustang; with its roaring, 120 horsepower 3.3 liter engine. 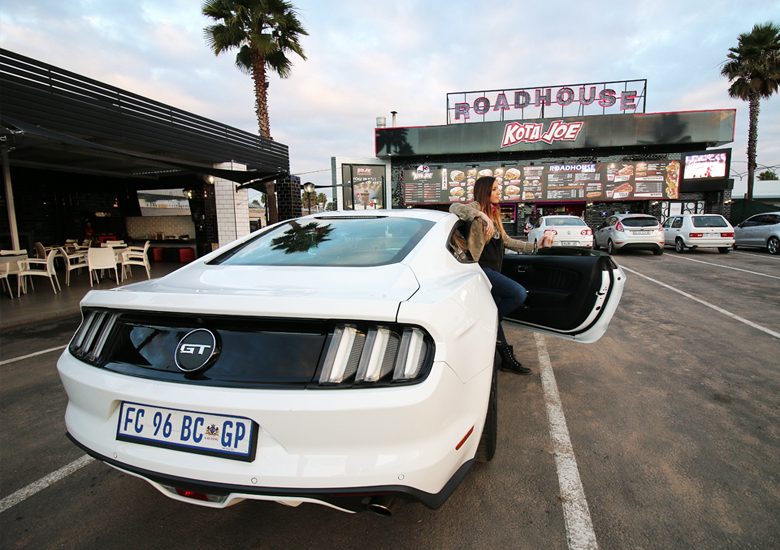 How proud would they be (and jealous no doubt) of you, rolling up in your modern, 5.0 liter v8 Mustang with its 306KW beast of an engine? A beast that has the pulling power of 416 horses! In South Africa, we may have had to wait close to 50 years for the comeback of the American icon (in a right hand drive), but all I can say is, it’s been well worth the wait! The 1965 Mustang is a classic, but get behind the wheel of a 2017 Ford Mustang 5.0 V8 Auto Fastback and the term, ‘rev up your engines’ takes on a whole new meaning. 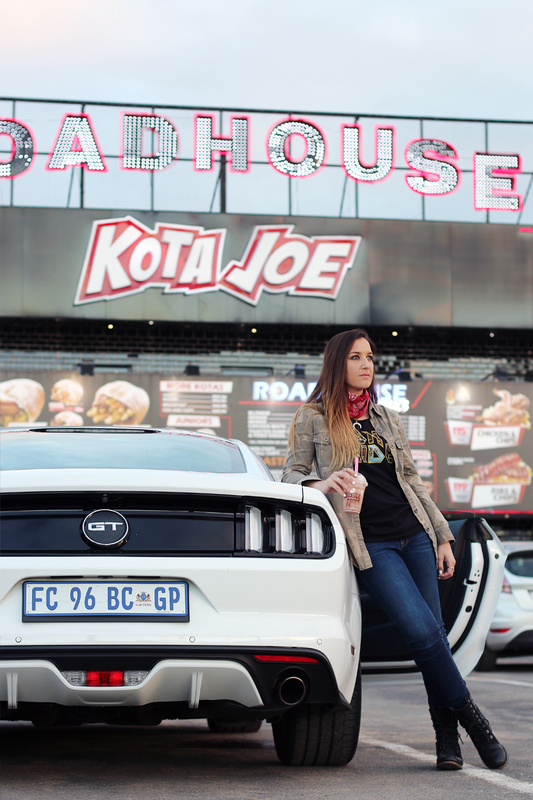 While the vintage and modern Mustang’s both yielded presence and power for their era, the new generation Ford Mustang 5.0 V8 Auto Fastback, much like Kota Joe’s Roadhouse – can best be described as old school meets new cool! 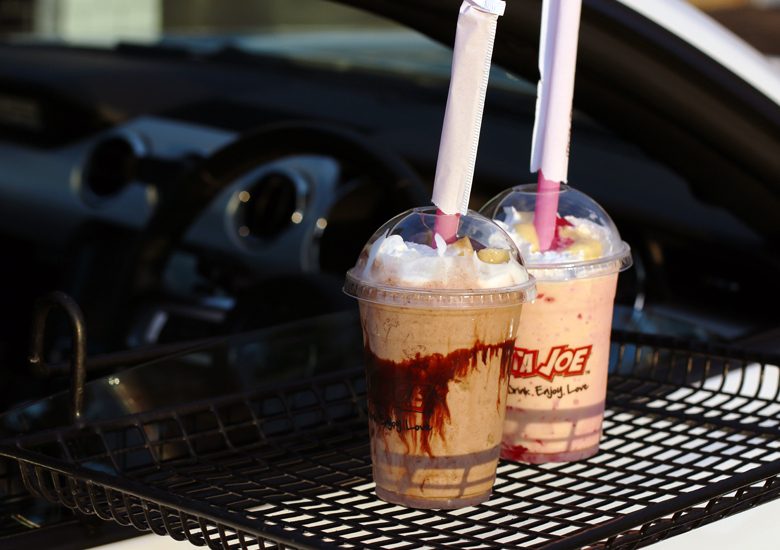 In the year 2017, not only are the shakes more loaded (you have to try Kota Joe’s Nutella & Banana milkshake), but the Mustang is more! More voom, more wow, more power, more safety, more sass, more class and it far surpasses its predecessor! 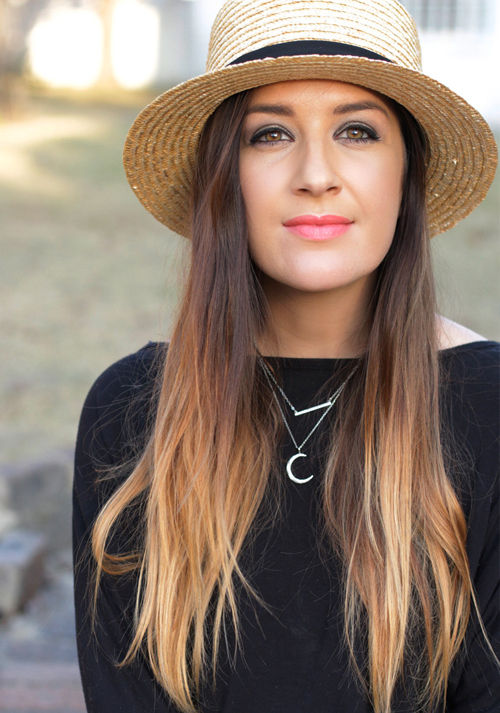 It has devilish good looks that combine classic with modern style, curves in all the right places and the heart of a wild animal! The 2017 Ford Mustang is a pony that rides like the wind and leaves you feeling like you’re living the vintage dream but with a modern mindset. It gives you a sense of nostalgic desire, yet its modern comfort, power and sports car engineering make you want to drive and drive and drive! 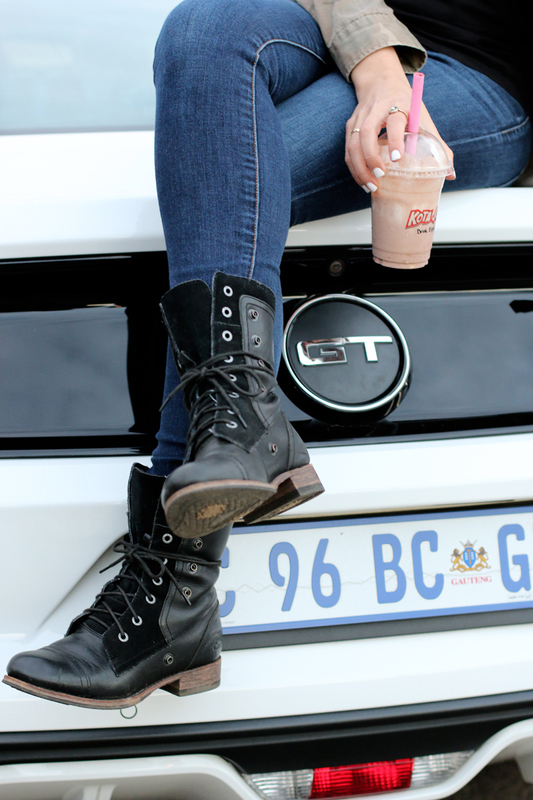 A car that yearns for adventure and one you won’t mind driving long distances (or sitting in traffic for that matter) just so that you can get a good milkshake. As long as you’re driving it, nothing else matters. Admired by some, envied by others and a definite head turner for everyone whose path it crosses. And trust me, when you drive a Mustang; whether seen or heard, heads will turn! Joy and excitement follow its wake, because it’s impossible not to get enthralled in the glory of such true beauty! While I love every square inch of her sculpted body, she’s got the sexiest tail on the road! I don’t know if it’s her sultry back lights that give a seductive wink, or the glossy black trim that defines her shape, but every time I see that tail, I’m hit with cupids arrow. Driving her, well whoa! That’s a feeling I haven’t quite managed to put into words – yet (but I’m working on it). The roar of that engine as she starts up is music to my ears, and sitting behind the wheel as she purrs – longing to be appreciated – is the most exhilarating feeling. A feeling that can only be topped by a gentle tap of the gas pedal. Besides the look, drive and power of the new Ford Mustang, I appreciate that you get what you pay for! And what you get is everything! For the lucky ones whose dream of a new Mustang comes true, when you sign the papers to make her yours, you get everything – all the features, all the bells and all the whistles. Just as they did in the old days! Unlike so many high end cars on the market today, you don’t get suckered into extra this and extra that; hidden costs and little add on features that take your top of the range, R850K car to a R1,6mil car before she leaves the showroom floor. When you take ownership of a new Ford Mustang, the sports car you paid for, is the sports car you get. 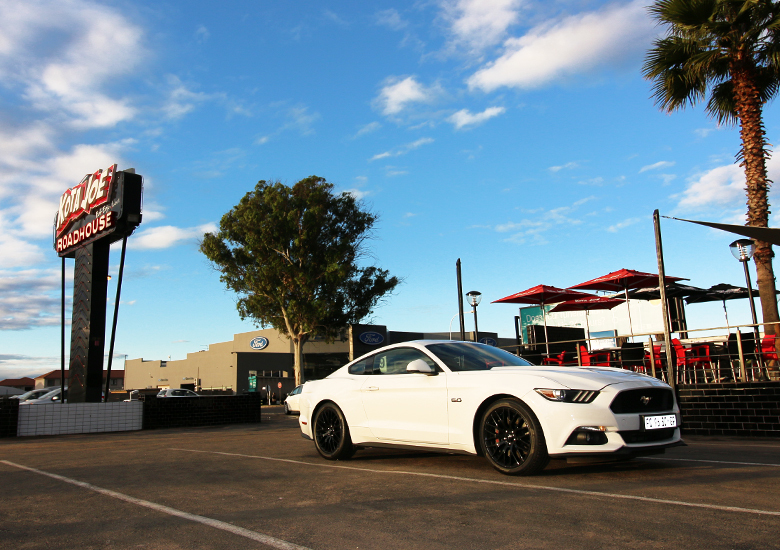 The Top of the Range, Mustang 5.0 V8 Auto Fastback from Ford has every feature (see all the features on Ford’s website), every luxury and every bit of power, all part of the price! You don’t pay extra for more bells, or for more electronics or for more power. 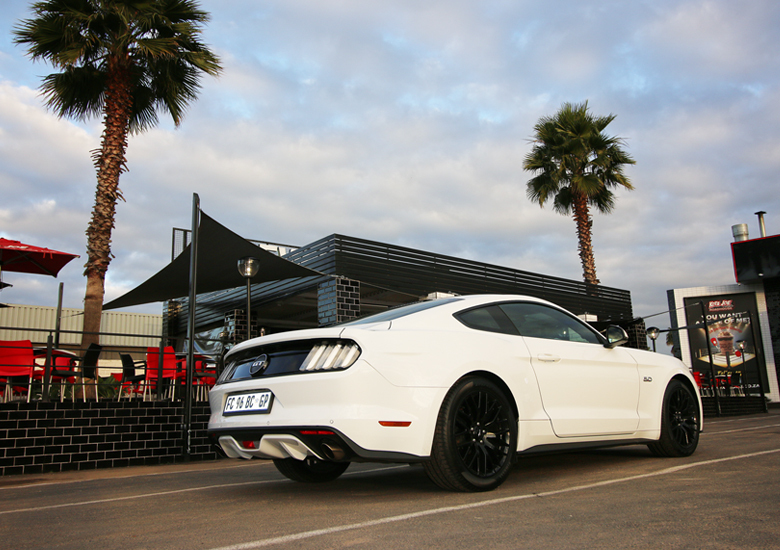 Of course, being a Mustang – a true enthusiasts car, you do have the option to supe her up to insanity afterwards with a ROUSH Performance or Shelby Conversion Kit. These conversions will take your Mustang from hero to superhero. Sports car to Super Car if you will, but they are done independently to Ford. The Ford models are kitted out as a standard. Something to think about when you make those all important purchasing decisions. As for me, my Mustang still lives in the dream. A dream that came true for a little bit, but one that felt so real, I experienced actual heartbreak as she drove off after our glorious seven day love affair. A love affair of just me, my Mustang and the open road!